The U.S. House of Representatives on Tuesday overwhelmingly passed a $10.9 billion extension of U.S. transportation funding through May 2015, a measure aimed at averting cutbacks in August in federal money for road, bridge and transit projects. The measure, paid for largely through revenue generated by pension accounting changes and higher customs user fees, passed on a 367-55 bipartisan vote, despite opposition from outside conservative groups. Senate Majority Leader Harry Reid said that "as soon as I can get to it," the Senate would begin considering a similar, $10.8 billion measure with some alternate funding provisions in the coming days. 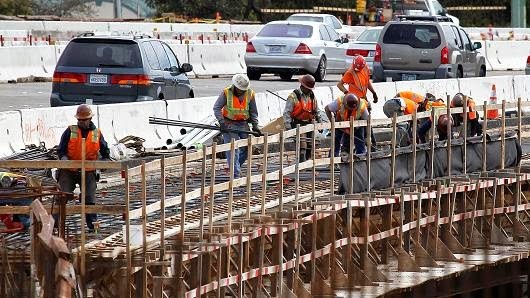 Without new money for the Highway Trust Fund, the Department of Transportation has said it will start to cut back federal funding for projects by nearly a third starting on Aug. 1, the same day Congress begins a five-week summer recess. The Highway Trust Fund, which has been supported by fuel tax revenues since its inception in 1956, has run chronically short of money in recent years because of higher construction costs and improved vehicle fuel economy. Trucking firms and many other industry groups favor higher fuel tax rates, unchanged since 1993, to return it to solvency. But House Republicans have ruled that out, and the biggest revenue source in the House-passed bill is often called "pension smoothing," which allows companies to reduce near-term contributions to employee pension programs by assuming a higher, historical average rate of return. That move is expected to boost corporate tax collections by the U.S. Treasury by about $6.4 billion over 10 years. The bill would transfer $1 billion in existing money to construction projects from a fund that helps pay for cleanup of leaking underground fuel storage tanks. The $10.8 billion companion measure passed by the Democratic-controlled Senate Finance Committee would also fully fund transportation projects through May, although it would rely less heavily on pension changes and more on revenues from measures to boost tax compliance. The White House said on Monday it would welcome the 10-month extension, to the chagrin of some Democrats who say it would push any decisions on long-term funding to a newly elected Congress next year. Among those is California Senator Barbara Boxer, who Reid said would get a Senate vote on her plan for a shorter, $8 billion extension. Boxer has argued a shorter extension is needed to force Congress to act on a long-term funding plan during the "lame duck" legislative session after November elections. On Monday night the White House endorsed the House Republicans’ plan to keep the Highway Trust Fund—which finances highways, roads and bridges—alive for the next 10 months, saving about 700,000 jobs. While the bill will bring the Transportation Department program back from the brink of a crisis, it uses an accounting trick known as “pension smoothing” to pay for it. Here’s a guide on why the short-term revenue raiser is no good for the long haul. What is pension smoothing and why should I care about it? Pension smoothing raises money for the government in the short term in exchange for increasing the debt over the long term. By reducing pension contribution requirements, pension smoothing temporarily increases companies’ taxable income to raise revenue for the government. But over the long-term, companies will be on the hook to contribute more to their pension funds, lowering tax revenue. Some conservatives, including fellows at the Heritage Foundation and Keith Hennessy, a senior White House economic advisor under President George W. Bush, have warned that pension smoothing increases the risk of a taxpayer funded bailout of the Pension Benefit Guaranty Corporation, the government insurance company that protects pensioners from risk in their private plans. Congress in the past has turned to the tactic in dire situations (see next question) because it is pro-employer and a revenue raiser in the short-term. Since the Congressional Budget Office scores bills in 10-year windows, supporters of the House and Senate bills to save the Highway Trust Fund can avoid questions about raising deficits in the long-term. It’s no one’s ideal revenue raiser. Sen. Orrin Hatch of Utah, the top Republican on the Finance Committee, told TIME last week he’s “not real happy about pension smoothing,” but still “dedicated” to passing this year’s fix. On Tuesday, reporters asked House Speaker Boehner at a press conference why he would support pension smoothing, which Republicans decried earlier this year as a gimmick when Democrats wanted to use it to fund an emergency unemployment insurance extension. Several outside think tanks and media organizations have announced their opposition to pension smoothing, including the left-leaning Center on Budget and Policy Priorities, the editorial board of the Washington Post, the bipartisan Committee for a Responsible Federal Budget and the conservative Heritage Foundation. Has pension smoothing been used before? In 2012, Congress first turned to the revenue-raising gimmick to fill another transportation funding shortfall. Last year, Sen. Susan Collins (R-Maine) included it as part of a failed proposal to repeal an Obamacare provision and end the government shutdown. Earlier this year, Senate Democrats and a handful of Republicans tried to use it to extend unemployment insurance. Now it will be used to save the Highway Trust Fund from insolvency. A month ago, Sens. Chris Murphy (D-Conn.) and Bob Corker (R-Tenn.) introduced a bill to raise the federal gas tax (currently around 18 cents a gallon), which hasn’t been changed since 1993 and is the main source of financing the Highway Trust Fund. The Corker-Murphy bill would address the cash-strapped program by increasing the tax by 6 cents in each of the next two years and then index the rate to inflation. Besides the Corker-Murphy bill, Congress could tax drivers on how many miles they drive and communities could set up more tollbooths. Other potential long-term solutions are in the works but unlikely to pass this year. You can read more opinions on underfunded pensions funding U.S. highways in Josh Barro's New York Times article here. While pension smoothing is a short-term fix, the reality is that it will exacerbate America's looming pension disaster. U.S. interest rates are heading lower for a variety of reasons, which will really hit pensions hard because their liabilities will soar. 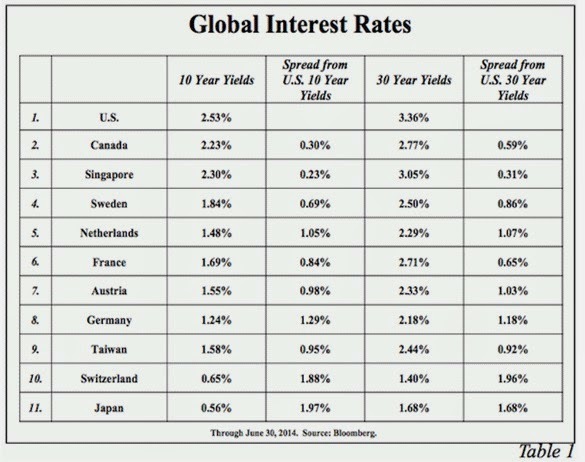 Table one (click on image below) compares ten-year and thirty-year government bond yields in the U.S. and ten major foreign economies. Higher U.S. government bond yields reflect that domestic economic growth has been considerably better than in Europe and Japan, which in turn, mirrors that the U.S. is less indebted. However, the U.S. is now taking on more leverage, indicating that our growth prospects are likely to follow the path of Europe and Japan. With U.S. rates higher than those of major foreign markets, investors are provided with an additional reason to look favorably on increased investments in the long end of the U.S. treasury market. Additionally, with nominal growth slowing in response to low saving and higher debt we expect that over the next several years U.S. thirty-year bond yields could decline into the range of 1.7% to 2.3%, which is where the thirty-year yields in the Japanese and German economies, respectively, currently stand. Think about this. What will happen to pension liabilities if U.S. 30-year bond yields decline into the range of 1.7% to 2.3%? Pension liabilities will explode because the duration risk is huge, especially at the long end of the curve (when yields are low and decline, the effect on liabilities is magnified). I think a much more sensible proposal is to raise the gas tax because the U.S. is the only country in the world with such a low tax rate on gas. But I also recognize that the U.S. labor market remains weak and raising the gas tax isn't a panacea and it could hurt the economy (the stupidity of troika in raising the Greek gas tax hurt toll revenues and exacerbated unemployment). There is a longer-term fix which will require public-private partnerships. Below, Macquarie Bank and Cintra own a 75-year lease on the Indiana toll road. Baruch Feigenbaum, Reason Transportation analyst, explains why this is working, and the private sector's role in improving infrastructure in the U.S.
Also worth watching is another CNBC interview where AECOM Technology Corporation CEO Mike Burke discusses the $6 billion deal the engineering giant announced with its acquisition of rival URS. In my opinion, there is no perfect solution. As I explained in my comment on the risks of toll roads for pensions, the success of public-private partnerships is greatly exaggerated. But the current patch job Congress is proposing is totally unacceptable. If the U.S. doesn't fix this problem with a long-term solution, it will head the way of India, which now has the dubious honor of having the world's deadliest roads.